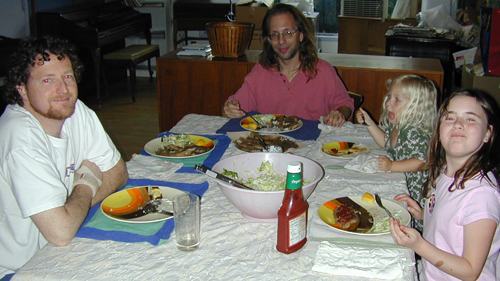 This is one of my favorite “fancy” meals that most everyone likes, even some people who don’t like fish (got my fish-hating brother’s seal of approval). It takes a while to make though (would be faster with thicker fish and a deep fryer) and it’s not exactly lowcarb. But yum. Start with fillets (defrosted if previously frozen) of your fish of choice. They must be free of bones and fairly thin, in the neighborhood of 1/2″ is good. I like Dover Sole. Talapia is good too. Cod works well if you get the right thickness and there are no bones. Cod is the traditional fish and chips fish, but remember that thicker cuts need a deep fryer to cook all the way through without ruining the crust. 2 lbs of fish works well for 2 hungry adults, one fish-loving child, and lunchtime leftovers. Trader Joe’s is a good source for less expensive frozen fish of good quality (I only buy wild fish from them). 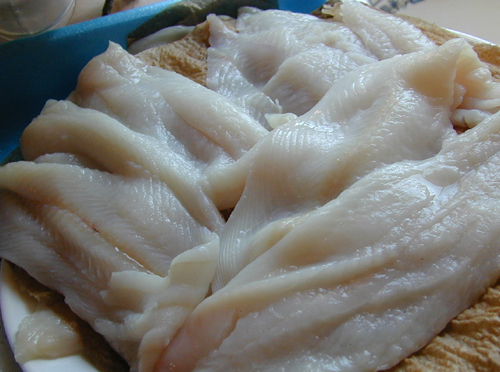 Costco has excellent fresh, wild Dover sole at a great price. Wash the fish if needed and lay on paper or cloth towels to get excess moisture. Partially frozen fish is okay if it’s thin and you get the ice off the outside. Make the egg substitute (or beat several eggs if you prefer). 1 tablespoon of flaxseed meal, ground fine in a coffee grinder or other machine, in 1/3 cup of water equals 1 egg. (Store flax whole in a cabinet then grind a bunch and stick in the freezer for easy access without anything going bad.) Put flax and water into a container that is 3-4 times the volume and nuke for a minute or so. Let cool to warm or room tempature. Mix with whisk or fork. Mix in a flat bottomed container with sides. A baking pan is great and those plastic boxes 1 lb of salad comes in works well too. I like half brown rice flour and half soy flour. This reduces the high carbs of the rice and adds some protein. The soy alone is too heavy and the rice is too light, so this is a nice balance. I’ve also made it with 100% corn flour (fine cornmeal) and with half rice and half corn. These are fine but cornmeal has a distinctive texture and flavor so it’s personal preference if that is what you want. Add salt and pepper to the flour mix, stir with fork. 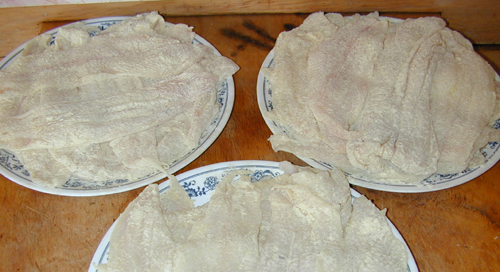 Coat fish with flour mixture, put aside on plate. I have done it without this initial coating several times and it really does make a difference. The finished breading not only is a bit thicker (this is not a thick commerical breading anyway) but it stays on the fish better. 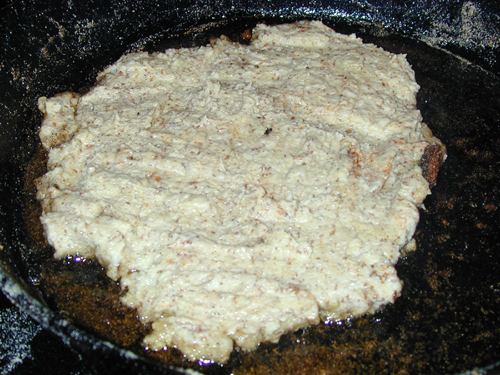 Dip fish in egg or flax goo. Let excess drip off but make sure all sides are well coated. Dip again in the flour mixture and coat well. 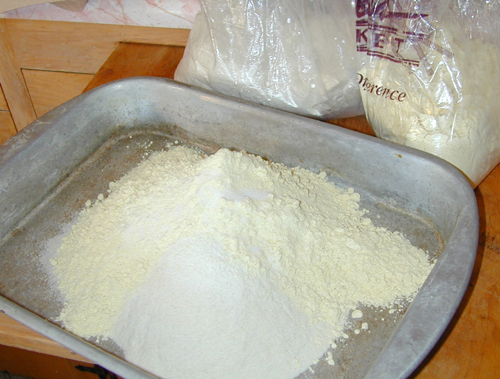 You can pile flour over the fish to ensure full coverage; don’t just dip lightly. 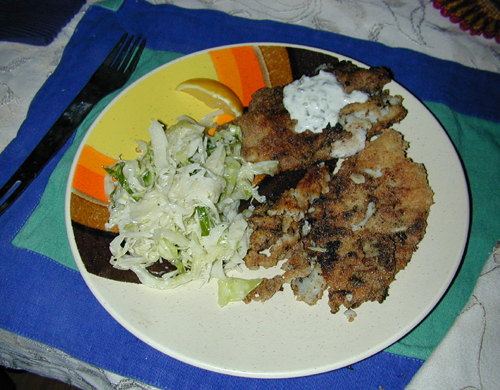 Fry fish in oil (I use extra virgin olive oil, but others are fine) at medium to medium-high heat. Too low and the breading gets really oily; too high and the breading browns and burns before the inside of the fish is done. Fry to golden brown on each side, adding more oil as needed. I use a 12″ cast iron pan which works very well. You might want to have two pans going if you’re doing a lot of fish. Remove finished fish to a plate with a paper towel to soak up excess oil. Do not put fish on top of other fish, even with paper towels between them. This will make the breading soggy. You can use the microwave to warm fish or to finish cooking fish in the middle, but it will ruin the breading. You can use the oven for the same purpose but watch for burning. Mix the leftover flour into the leftover egg, adjust with water or flour to make a very thick pancake batter. Add more salt if desired and some seasoning (I like an Italian herb mixture). Fry until light brown on the outside and set in the middle (I turn the heat off under the cast iron pan after the first flip). Good warmed up the next day. Serve the fish with condiments of your choice. I like fresh lemon wedges (not slices) and vegan tartar sauce. My niece uses catsup and turned Miriam on to it too. I usually serve with vegan coleslaw. Leftover fish is great cold in a sandwich or wrapped in a tortilla. Or just as is. I always make extra because the leftovers are so good.